I was brought up on the east cost of Sweden in the wealthy 70-80’s. We had 10 weeks of summer school holidays. My mum worked part-time in the summer and every sunny day we were picked up at noon in the old yellow Saab. My mum had packed the bags for the beach. My dad worked at Saab and they had a resort just outside my hometown. It was a peninsula with 20 small cottages, a swimming pool, rowing boats and a beach.This were the place we headed towards every day. The same procedure took place every sunny afternoon. We arrived close to 1 pm and unpacked sandwiches, radio, coffee, syrup and mandelkubbar (almond cake). At 5 past 1 the genius radio program “Sommar” started . A program that have been broadcasted since 1959. Well known people get the air for 90 minutes to tell their stories, reflections, memories and playing their favorite music. We listened to the program while we had our sandwiches. After a long bath we sat down for coffee (me and my sister had syrup) and almond cakes. The cake gets dry very fast so we washed it down with the syrup. Never has a dry cake tasted as good as on the cliffs after a long bath. 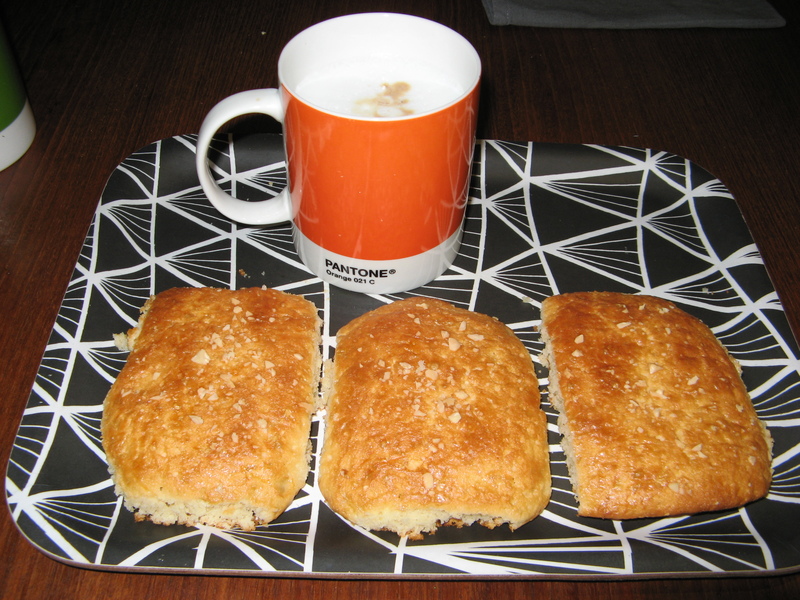 Yesterday we baked mandelkubbar for the first time. They are easy to make and only takes 30 min including oven time. You should enjoy them when they are still warm from the oven. egg, chopped almond and pearl sugar for decoration. Heat the oven to 200 ⁰ C. Chop the almonds and grate the bitter almond and put aside. Whisk sugar and butter. Add egg, yoghurt to the sugar mixture. Mix flour and hartshorn salt and add together with the almonds to the mixture. Make 20 rectangular cookies and put on a plate covered with oven-paper. Whisk the remaining egg and sprinkle on the cookies. Add chopped almond and pearl sugar. Bake for 12 minutes. When the Mandelkubb gets dry, and this will only take a couple of days, you could use them for this easy-to-make dessert. Split two almond cake in smaller pieces. Marinate in 1 dl Amaretto. 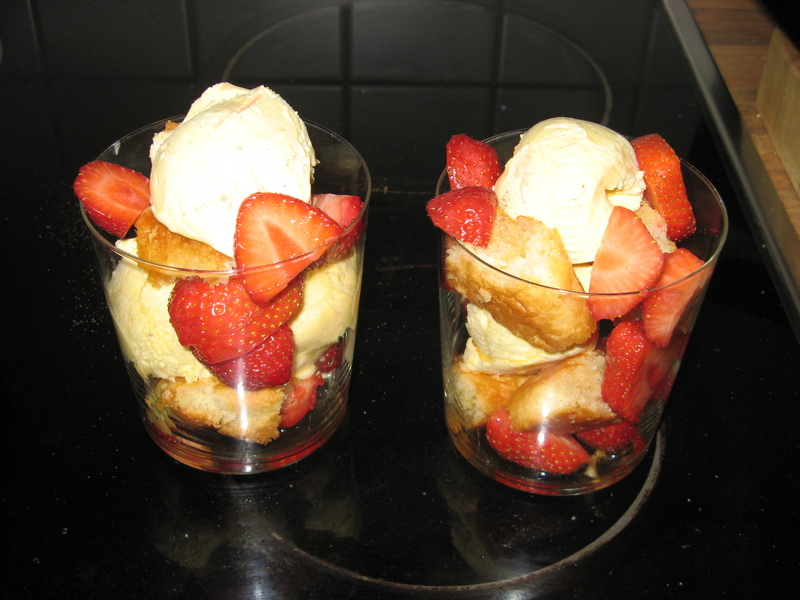 Put the marinated almond cakes, strawberries and ice-cream in layers. Hurray for the orange season! Oranges can of course not grow in Sweden or in Germany, besides from in a greenhouse, but nevertheless the orange season is now. I, for one, have been very sceptical to cooking with oranges. But I believe you must try everything at least once so we gave it a try and it blow my taste buds away. It was marvellous! Slice the fennels and the red onion really thin. Fillet the oranges and try to save the juice for the dressing. 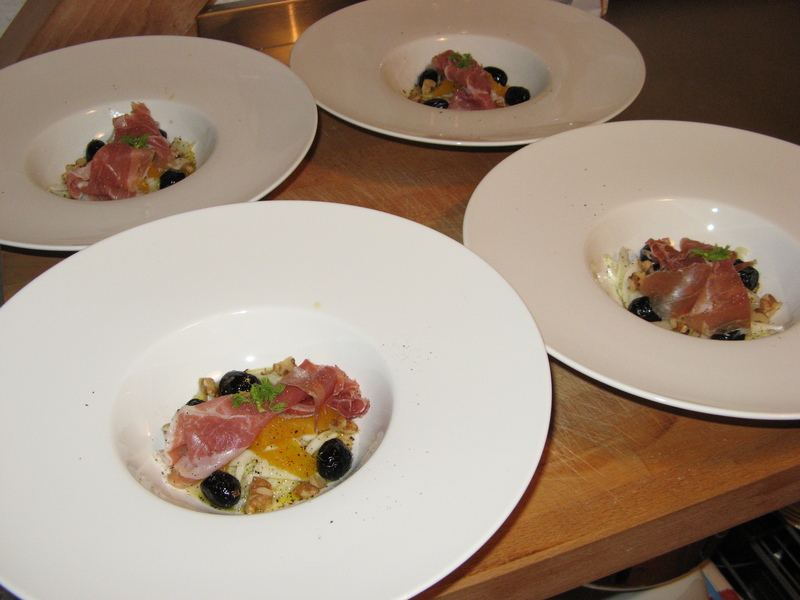 Blend fennel, red onion, orange fillets and walnuts on plates. Add the olives and the meat. Mix the dressing together and pour it carefully on the salad. Decorate with the fennel dill if it’s good. Serve immediately! 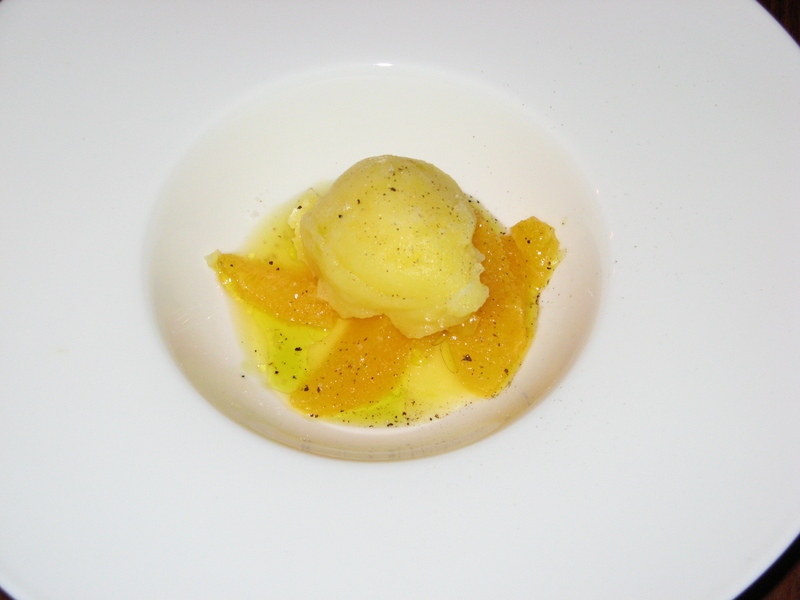 Start by making the sorbet; warm some of the orange juice up and melt the gelatine leaf. Blend with the rest of the juice, taste it with the syrup, strain and pour it into the ice cream maker. Make a “mirror” of your best olive oil at the bottom of a plate or a dessert bowl. Fillet two oranges and place the fillets in the olive oil. 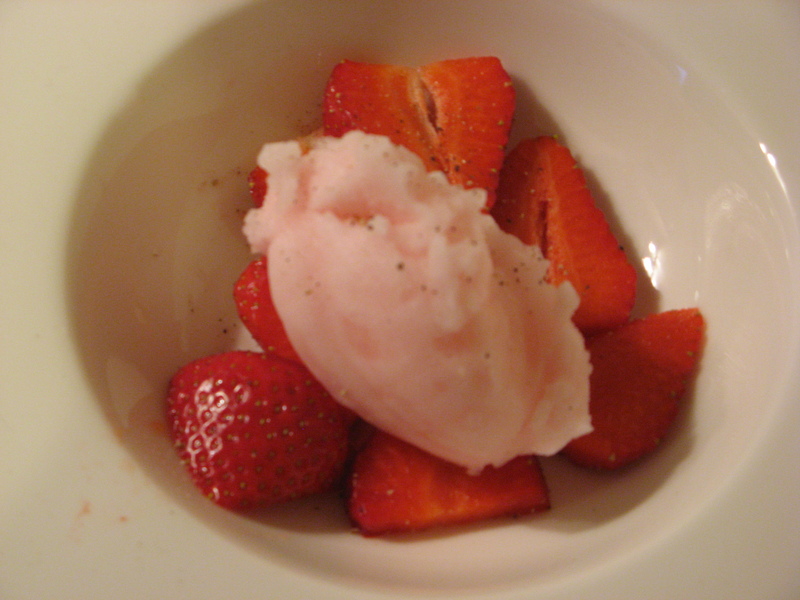 Put the sorbet on top, add a bit of sea salt and fresh grinded black pepper. When we plan what to eat we always end up discussing whether we should have cheese or chocolate as dessert. That’s the beauty with a five course or a seven course than you can have both! Soak the gelatine leaves for 5 minutes in cold water. 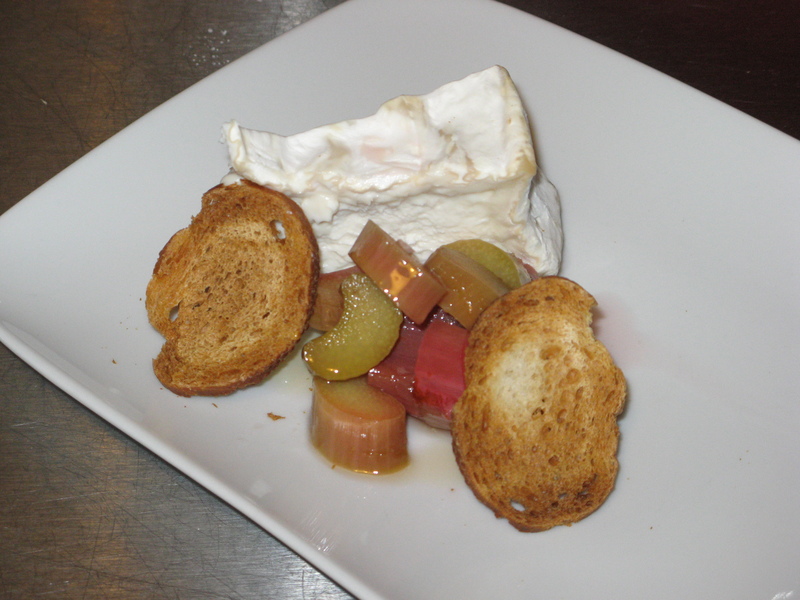 Use an electric mixer and mix goat cheese, crème fraiche and salt to a smooth cream. Let 1/2 dl of the cream come to a boil, squeeze the water out of the gelatine leaves and stir them into the warm cream until they melt. Blend the warm cream with the cold cream. Dress a small tin or dish with plastic wrap, pour the cream and let it set in the fridge at least 6 hours before serving. Blend all the ingredients in a pot and boil until 1/2 dl remains. 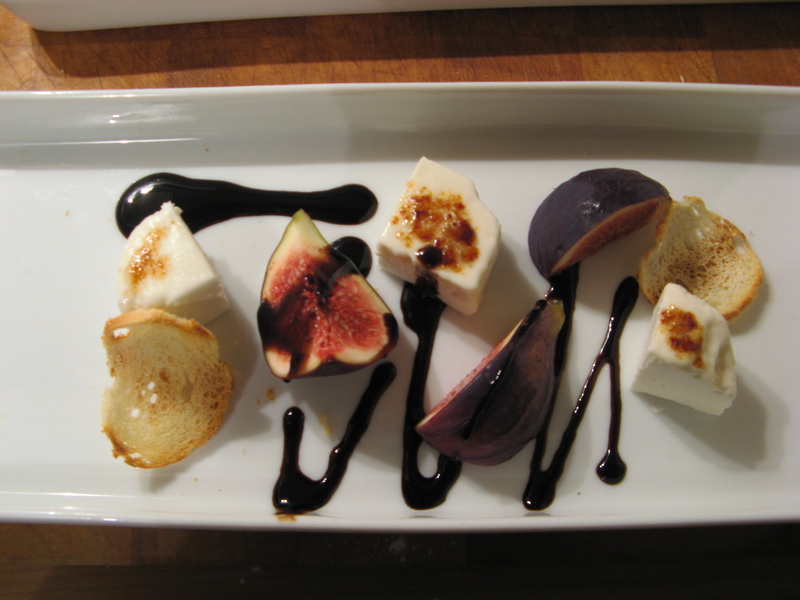 Before serving cut the goat cheese cream in cubes, toast the baguette slices, cut the figs and make a nice pattern with your balsamico reduction. Done! Set the oven to 175 degrees C. Butter small forms (1,5 dl) and powder them with cocoa. Melt chocolate and butter in a water bath, when melted lift up the bowl from the water. Whisk eggs, egg yolks and sugar in a large bowl. Pour the chocolate/butter mixture and blend. Sift the flour into the mixture. Fill your forms to 3/4, put them on a baking plate and bake them for 5-6 minutes. Turn the baking plate around and bake for another 4-6 minutes or until the edges of your ganaches looks fixed and seems to let go of the form. Don’t bake them to long – the middle of the ganache shall be runny. If you don’t want to eat your ganaches directly, you can put the forms, well wrapped in plastic, in the fridge until serving. Bake them 2 x 9 minutes instead. Whisk egg yolks and sugar in a large bowl. Let milk, cream, vanilla pod and liquorice come to a boil. Pour the heated fluid on to the egg/sugar mixture during whisking. Warm all of it until it reaches 85 degrees C. Strain the mixture and pour it into an ice cream machine. 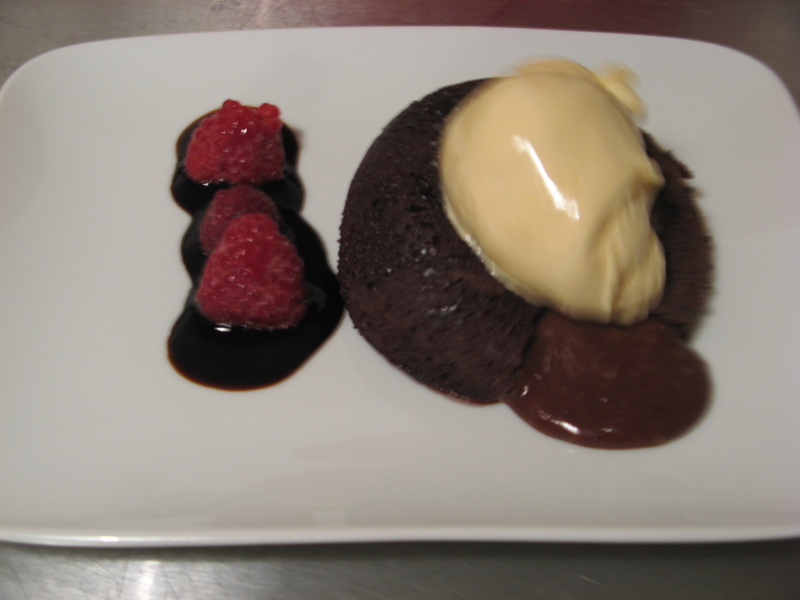 Serve your ganaches with the ice cream, raspberries and balsamico vinegar. Lack of passion in your life? Then you should try this smooth, fresh and tasty passion fruit Panna cotta. Let the cream, the sugar and the vanilla pod come to a boil. Pull it away from the stove. Add the soaked leaves (soak them in cold water and squeeze out the water before blending them) of Gelatine and let them melt in the cream mixture. Let it cool of a bit, remove the vanilla pod and add the youghurt. Pour the mixture in soup plates or in small bowls, leave them in the fridge for about 3 hours. Soak the gelatine leaves in cold water, squeeze them and melt them carefully in a pot together with the passion fruit juice. Let it cool of a bit and poor the jelly carefully on top of your Panna cottas. 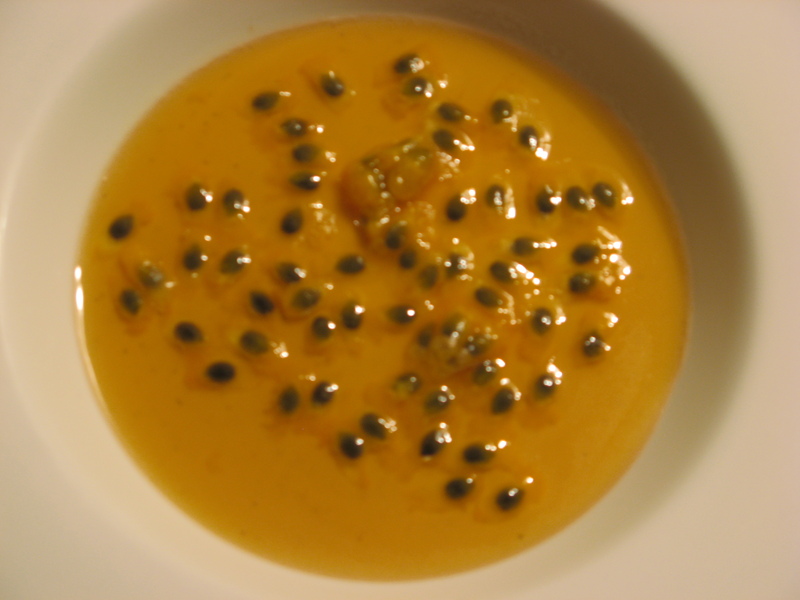 Before serving, scoop out half a passion fruit on each portion. You can also decorate with fresh mint leaves. 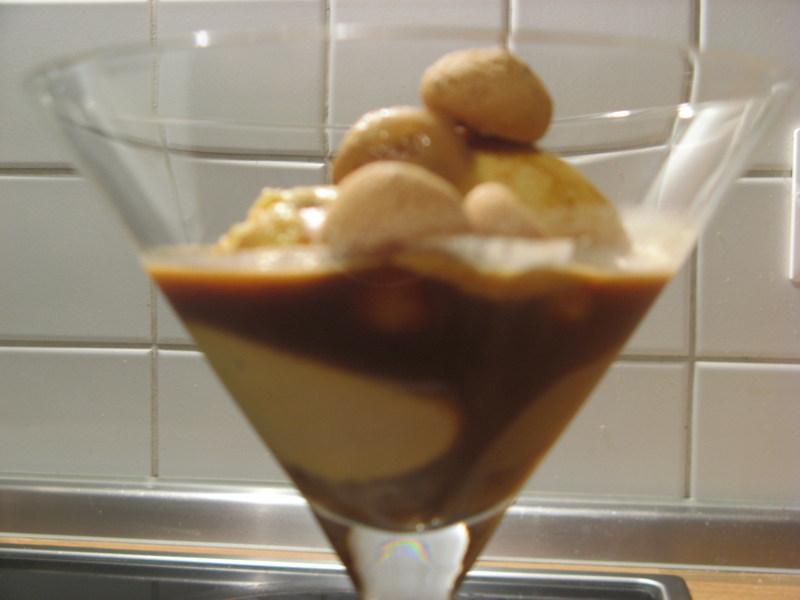 Use caramel sauce as the finishing touch! Boil the raspberries with wine and sugar. Pour the mixture in a glass, let it cool off. Whip the meringue mixture. Add a layer of cookie crumbles to the cool raspberries. The next layer is the meringue mixture. Burn the meringue preferably with a Creme brulé burner, if you don’t have one use the grill in your oven. Remember it shall not be warm just get a bit of a colour. 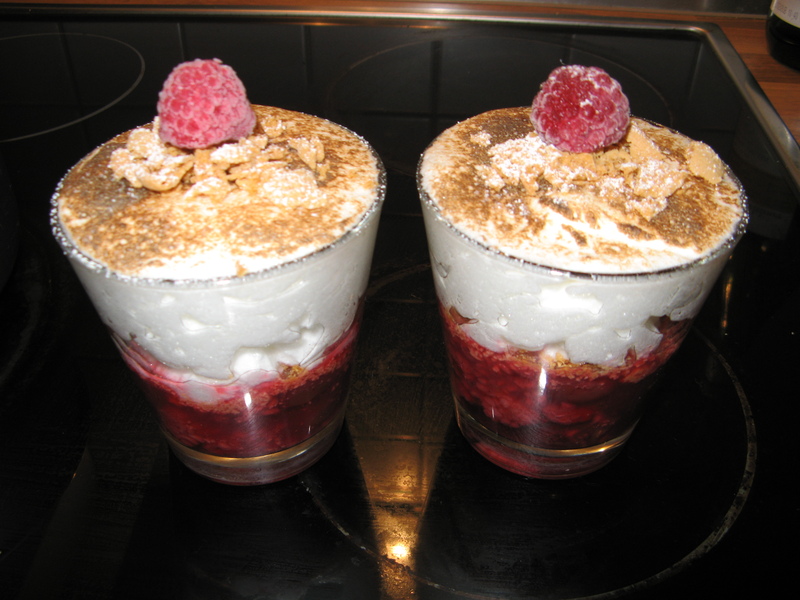 Decorate with cookie crumbles and raspberries. Peal the apples and cut them in pieces, fry them in sugar and butter with a twig of rosemary. 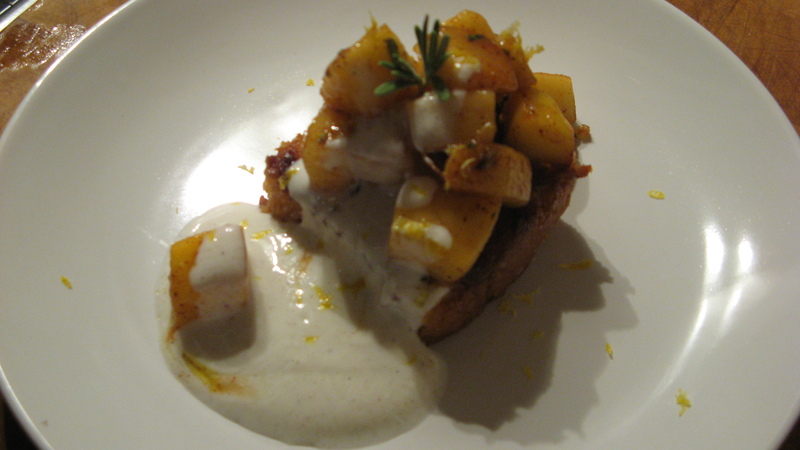 Blend the yoghurt with the honey and the finely chopped rosemary. Grill or fry the sponge cake so it gets a bit of colour. Place the sponge cake on a plate, add the apple cubes on top and pour the yoghurt mix over. Decorate with rosemary and lemon zest. Our sourdough is dead. Two weeks in Sicily and the poor thing died… Well rest in peace. We’ll make a new one! Until it’s done we need to bake bread with yeast. 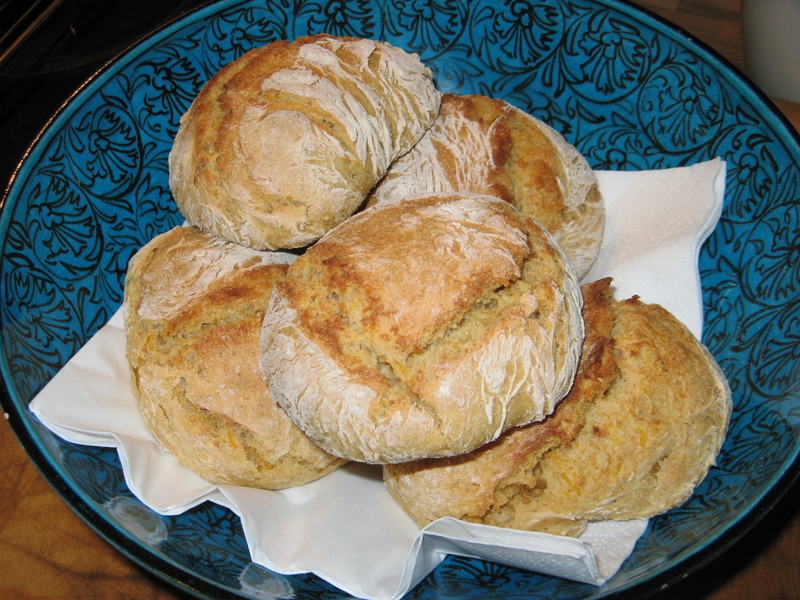 Found these lovely breakfast buns on a Swedish recipe site. Blend the ingredients together and let it ferment for approximately 30 minutes. The dough should have doubled in size. Make 10 rolls and place them on oven paper and put the baking plate in a cold oven. Set the temperature to 225 degrees Celsius. When the oven reaches 225 degrees your rolls are done. Takes less than an hour! We ate ours with a good cheese, elk sausage and horseradish spread with smoked salmon.